string(1173) "Resource Centre > Uncategorized > Shaky Foundations: Labour Exploitation in London’s Construction Sector"
This report draws on interviews and surveys with migrant construction workers in London to examine the causes of labour abuses that can lead to exploitation in the construction sector. 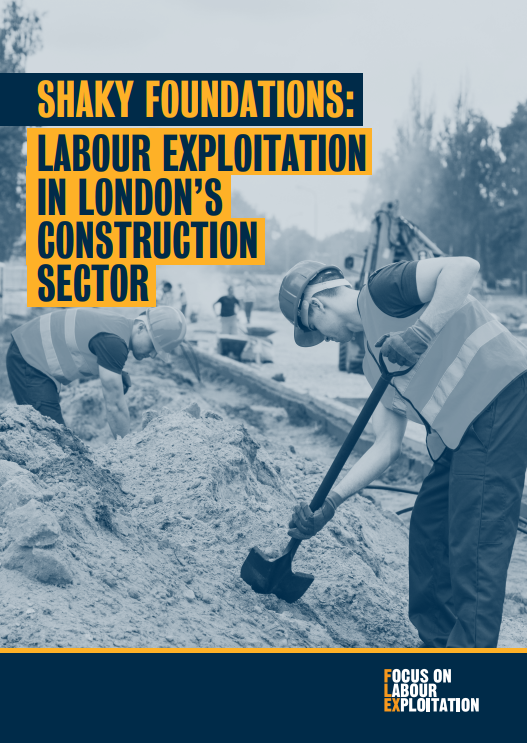 The report calls for urgent action by the Government, the Director of Labour Market Enforcement, the Mayor of London and the construction industry to put an end to abuse of London’s construction workers. The construction industry is a vital part of the UK economy, but has been recognised as high-risk for exploitation and modern slavery. In their research, Focus on Labour Exploitation (FLEX) uncovered a range of abuses happening in the low-paid sections of the industry, where work is often short-term and insecure making it difficult for workers to complain. One in three migrant workers surveyed had not been paid for work, and one third had faced abuse or discrimination. Following the Brexit vote, 15% said they were wrongly told they can no longer work in the UK. The construction industry relies on a flexible workforce to fill worker shortages quickly. When costs run high, labour is often cut to save money. Many workers are self-employed, and so have little security or protection against abuse, others are not given contracts setting out the terms of their employment. The threat of being fired at short notice, combined with lack of protection, means that often workers who face problems are too afraid of being left out of work to challenge unscrupulous employers or seek help through official channels. Those workers FLEX interviewed felt they had no choice but to endure poor conditions, as they couldn’t afford to risk losing their jobs by complaining. In order to combat abuse and exploitation, more money needs to be made available to the UK labour inspection authorities to carry out proactive inspections in the construction sector. While subcontracting labour is the norm in the construction industry, this makes it difficult for companies to oversee working conditions of workers further down the chain. A licensing model to monitor labour providers, enforced by a labour inspectorate, would go a long way to make sure that operators in the construction supply chain are treating workers fairly. London is constantly under construction, but FLEX’s report shows that much more needs to be done to protect the workers building its homes and offices from exploitation. As Brexit brings changes for UK economy and industry, we must make sure that the migrant workers the construction sector relies on are safe from abuse and protected from exploitation.